Leupold makes great laser rangefinders and so the opportunity to test out two of their newest models, the top of the line GX-5i3 (street price $550) and the entry level GX-1i3 (street price $300), was welcomed. Our ten round test procedure was simple. For the first two rounds every yardage was shot with both units and then, alternating, four rounds were played with each. The results were hardly unexpected given my experience with Leupold products including my “regular” rangefinder, one of their older models a GX-2i2. And trying the new models under a wide variety of conditions each could clearly be appreciated. The GX-1i3 and GX-5i3 share several features starting with both have a 6x magnification with an eyepiece that can be focused for the user’s vision. Both weigh about the same—7 oz. for the GX-1i3 and 7.3 oz. for the GX-5i3. Their lasers have a fast rate of pulsing so not only are distances quickly determined but any slight movement by the user is, for all intents and purposes, ignored by the unit. Both have a fog mode and one touch scanning so measurements to the pin and say, the top of a bunker can be made while sweeping the entire area. The difference between the two however is in the ability of the GX-5i3 to be personalized to the user and the outside conditions because it measures the slope uphill or downhill and compensates the yardage accordingly. Called True Golf Range (TGR) it tells you how much longer an uphill shot is playing and likewise how much shorter a downhill shot plays. The GX-5i3 as has a club selection feature which, once the distance you hit three clubs is entered the unit suggests which club to hit based on the TGR and even shows if you are between clubs. In one word, amazing. Add to that the GX-5i3 also makes yardage compensations after temperature and altitude are entered and all you’re left to do is swing the club. To make the GX-5i3 USGA tournament legal these adjustment features may be turned off leaving only the line of sight distance feature similar to what the GX-1i3 provides. We particularly liked the way the GX-1i3 fits in the hand making it very easy to use. The GX-5i3 is handy as well, just that we like size of the other one. The view through the eyepiece is the same though the GX-1i3 has a choice of seven aiming reticles while the GX-5i3 has three. Both reach out and give back yardages extremely well, to a tenth of a yard. The head to head comparison didn’t find any meaningful discrepancies…to a tenth of a yard. Now if my swing were able to do that we’d be all set. Negatives: You are getting a whole lot more in the GX-5i3 but at a $250 higher price and you should think carefully if, to you, the features are worth the extra outlay. In my mind there’s no question they are. Some who tried both units didn’t like the more “ergonomic” shape of the GX-1i3. We did. Recommendation: We highly recommend either unit. 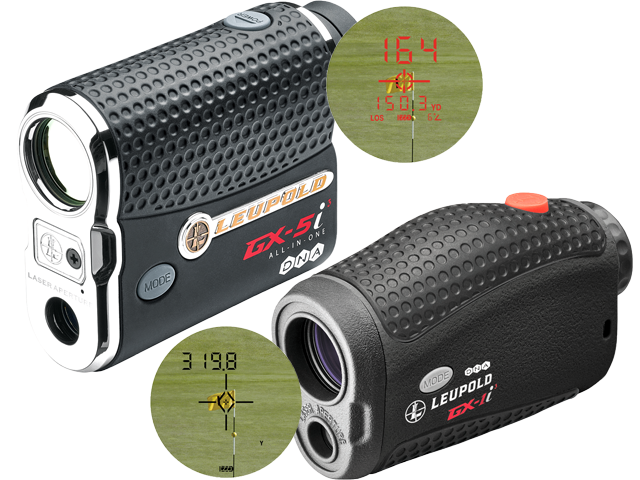 Probably the best all-around laser rangefinders we have tested and the ease of use is tops.